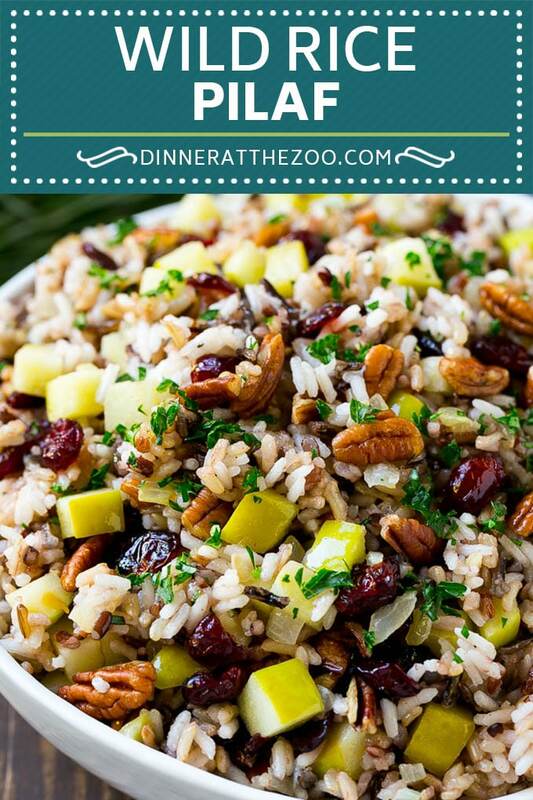 This rice pilaf is made with a wild rice blend, apples, dried cranberries, pecans and fresh herbs. It’s a colorful and hearty addition to any meal and is perfect for the holidays. When it comes to the holidays, I am all about the side dishes. 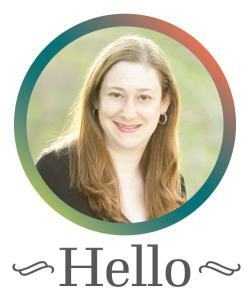 Some of our favorites include sweet potato casserole with marshmallows and honey roasted carrots. 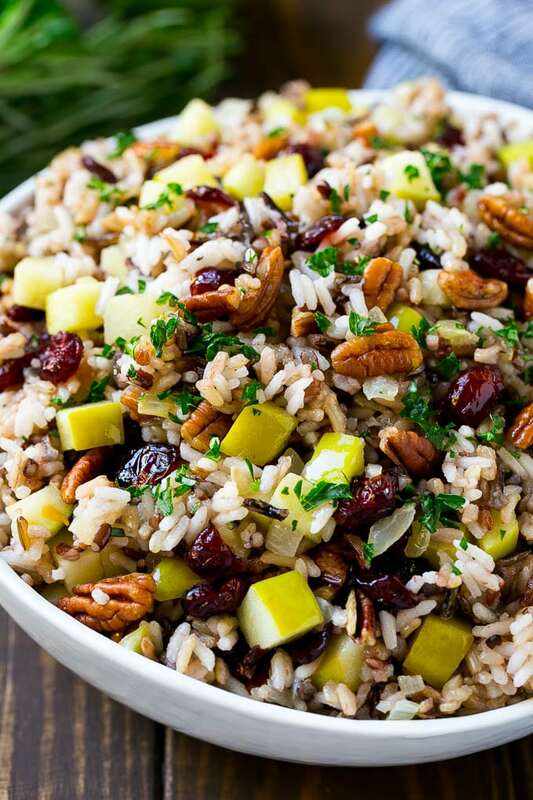 This wild rice pilaf is also on my must-make list, it’s perfectly sweet and savory and is so festive. It also makes for a great vegetarian main course. There’s nothing like a good rice pilaf, and this version happens to be my favorite. It’s loaded with sweet and savory ingredients and is full of different flavors and textures. I could make a whole meal out of this rice! It’s a great option for the holidays, especially if you have vegetarians in your family. How do you make rice pilaf? This recipe calls for wild rice, which is hearty and flavorful, but does take some time to cook. While the rice is simmering away, I prepare the rest of the ingredients which include sauteed onions and apples, dried cranberries, pecans and fresh herbs. Toss everything together and you’re got one amazing dish. The most basic definition of rice pilaf is rice cooked in a seasoned broth. Rice pilaf often contains other ingredients such as vegetables, herbs, fruits and nuts. 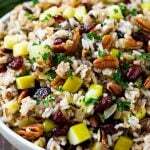 This is a fall version of rice pilaf which is why I’ve included ingredients like cranberries and apples. What is the best rice to use for rice pilaf? I’ve used a wild rice blend here, which is a combination of brown rice, wild rice, red rice and black rice all in one bag. You can also use regular brown rice if you prefer. You can make this dish vegan by substituting olive oil for butter. I use a blend of fresh rosemary and parsley in this pilaf, but other great options would be sage or thyme. I went with Granny Smith apples because they hold their shape and don’t get mushy in the pilaf. You could also try a Gala or Honeycrisp Apple. No pecans in the house? Try walnuts instead. No cranberries? Dried cherries also work great. You can make this rice pilaf up to a day in advance. Cover it and store in the fridge, then reheat in a pan over low heat. You may need to add a little more butter when you reheat the rice if the mixture seems dry from being in the fridge. 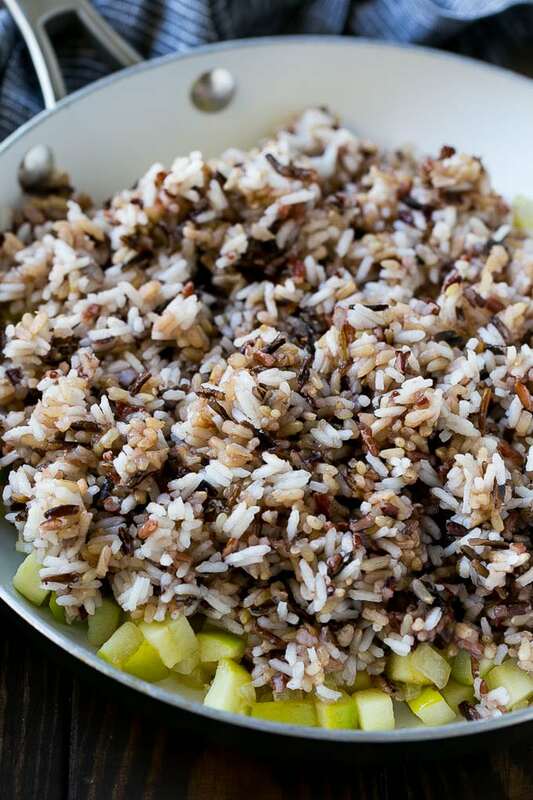 This wild rice dish has it all, and it’s sure to get rave reviews from family and friends. It’s so full of color that it’s almost too pretty to eat! 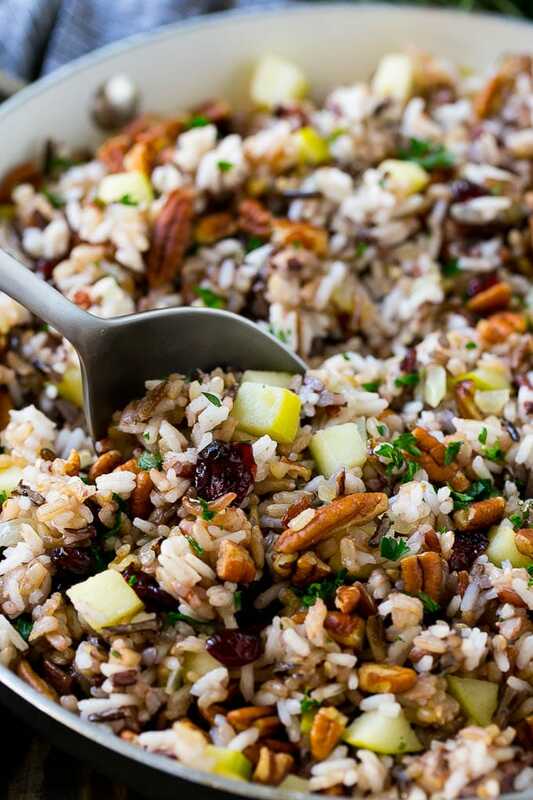 This rice pilaf is made with a wild rice blend, apples, dried cranberries, pecans and fresh herbs. It's a colorful and hearty addition to any meal and is perfect for the holidays. Combine the wild rice blend and chicken broth in a pot. Cook the rice according to package directions. While the rice is cooking, melt the butter in a large skillet over medium heat. Add the onion and cook for 4-5 minutes or until softened. 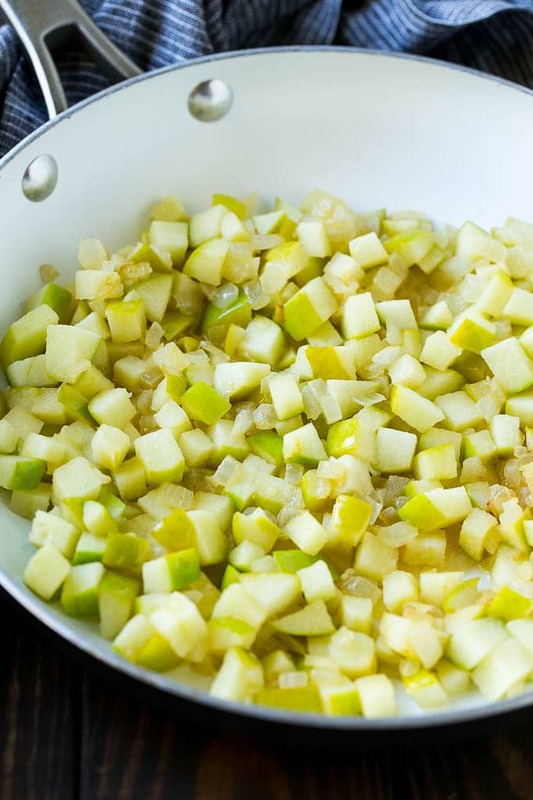 Add the apples and cook for another 3-4 minutes or until softened. Pour the cooked rice into the pan with the onions and apples, then stir to combine. Add the dried cranberries, pecans, rosemary and parsley to the pan. Stir until thoroughly mixed. Season to taste with salt and pepper, then serve. What do you recommend if I want to make this for thanksgiving but have an hour drive? How should I keep it warm? Or should I re warm it on stove once I’m at our destination? You could absolutely just re-warm it when you get there. What I would recommend is to follow the recipe through step 5, then you can transport it from there. When you reheat it, add the rest of the ingredients in step 6. Happy Thanksgiving! Oh yum!!! I want this for thanksgiving dinner! I love rice pilaf with nuts too! This looks so good. I love the combination of sweet and savory together. I bet the textures are great too. I tried this rice pilaf with chicken last night and it was delicious! the flavor was incredibly good and I will definitely be making this again. Any ratings from someone who has made it? This is a brand new recipe that just came out 2 days ago, typically it takes a few weeks before reviews start coming in! I am so hungry now! This rice pilaf looks so inviting and perfect for tonight dinner! My family will loves it! This looks so delicious. I am new to cooking and checking out recipes to try out and I guess this would be great to try. Let’s see how will my hubby react when I served him this food. I hope he will liked it. We too make an Indian version of the Rice Pilaf that we call Pulao. It is made with special flavoured rice and lots of veggies with a generous sprinkling of spices. Cashew nuts and raisins are also used for garnishing. This looks like a wonderful Thanksgiving side dish. We love cranberries at our house. I know this would be really popular with the gang. 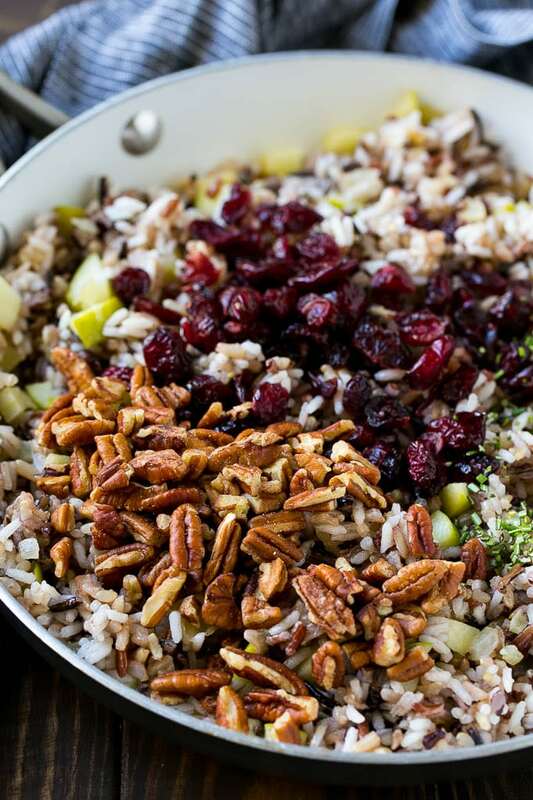 This rice pilaf recipe looks like the perfect fall dish. I can see myself serving this one for Thanksgiving. This looks and sounds amazing. I love to cook with cranberries. I can’t wait to try this recipe, I know my family is going to love it. OK how absolutely delicious does this sound! What a great rice pilaf! i bet it would go amazing as a rice sidedish for so many things! This is the kind of rice pilaf I need to start making. I’m loving all of those extra flavors. It will be so fun to pair this with some meals! Ooh this recipe sounds so tasty! Thanks for including the cherry and walnut switch up as I often have walnuts in the pantry for Fall baking. This looks so delicious! I’m all about cranberries, so this would be the perfect combo for me. I will have to make this for my family soon. This sounds really delicious and I love the looks of it. Also so healthy and would make such a great side dish. Putting this on the to make list.